I remember that when I was in high school, there was a Magnolia ice cream parlor along Shoe Avenue adjacent to the Marikina Sports Center. They served all kinds of ice cream, popsicles and frozen desserts. Their banana split was one of my favorites. I've never seen another ice cream parlor in Marikina ever since. That's why I was surprised to discover an ice cream parlor across the Riverbanks mall called "Ice Cream House - Sa Riverbanks". I haven't tried it yet but it any store dedicated to desserts like these is already tempting and favorable in my book. In addition to ice cream, they also serve pizza and coffee. With summer now here and each day is a hot and sunny day, this is a cool way to relieve yourself of the weather. 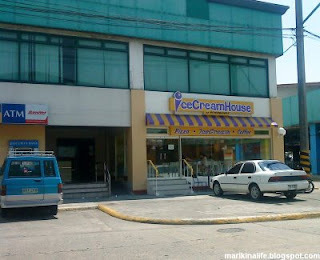 "Ice Cream House - Sa Riverbanks" is located across Country Style at the Riverbanks Mall. It's at the ground floor of the call center building and along RCBC and the Security Bank ATM.